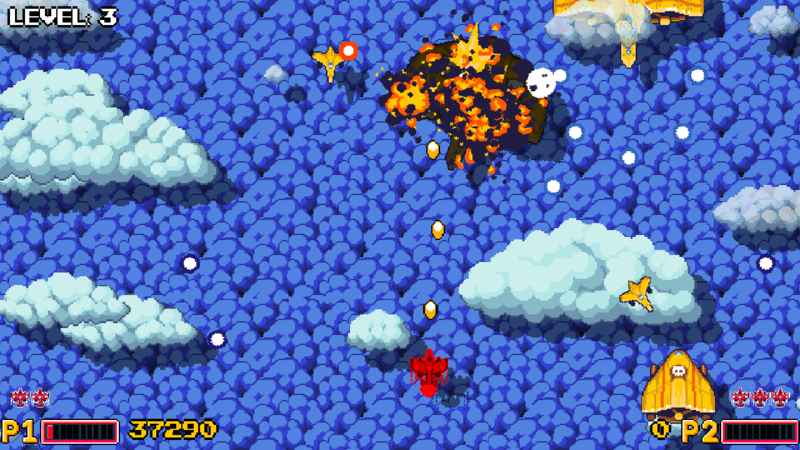 For Windows, Cloud Cover a simple shmup with no pre planned levels. Everything is random within reason. Kill X enemies to get to the next level. 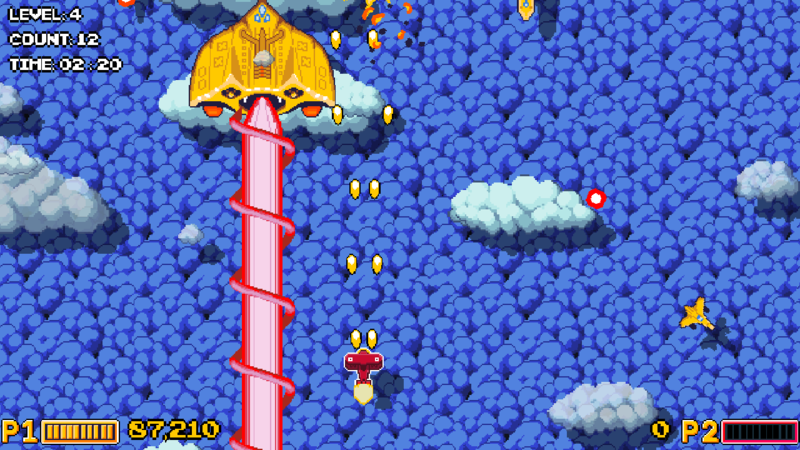 Each level is themed with its enemies. Every 3 levels has a new boss fight. There is enough original content for 10 levels or 12+ minutes before the game just dumps all the enemies into a level. I tried to be different, by having the player move on only an X axis, but allowing the player to dash and wipe bullets with the dash. There are three difficulties, and five playable ships. 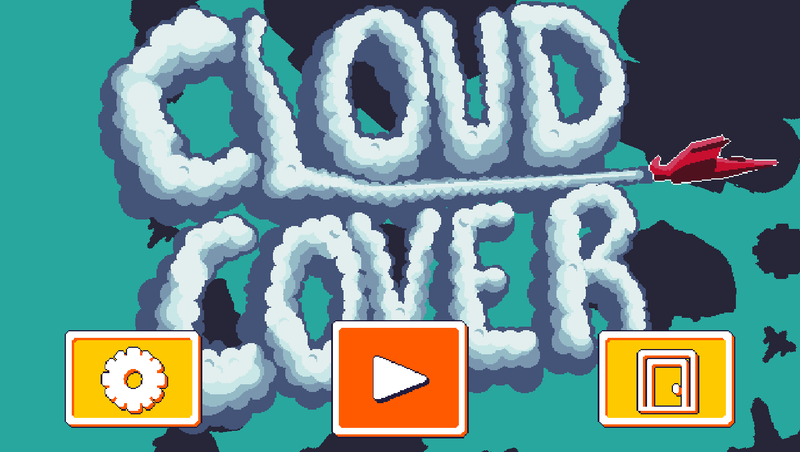 Cloud Cover is a simple, vertical shmup made in a week for a game jam at my local collage and after the jam I worked on it for another week. I'm struggling with what to do with it and where to go next with it or just let it die. It was not received well at the game jam, but I tweaked it according to the specifications of the casual players. I understand that they are not the target audience for shmups, so that's why I'm here to ask you to try it and thank you for even reading this far. - Full controller and keyboard support. - 3 lives and a lot of health to combat an intimidating amount of bullets. - 8 items to collect including weapons, magnets, bombs, points, health, and lives. - 10 enemies and 3 bosses. - 5+ selectable ships to pilot, each with their own stats. - 2 player support with various input methods: both on keyboard, 1 on keyboard 1 on controller or 2 controllers. First you select your ship, but then you select your pilot. Each of the 20 pilots has different pros and cons. Some increase the likelihood of specific things being dropped from enemies. Others increase attack power or give dash to ships with no dash. Since this project is about me getting better at art, I made art for the different pilots. While they are each similar, using the same template and then modified, they turned out well. These pilots offer more diversity to players to tweak things more. Some pilots have no bio, so expect tweaks and more pilots to come. Ducky is similar to Slipstream. There is no dash, Ducky is quick, but frail. To make up for this frailty, Ducky does more damage than Slipstream. Oh and Ducky is clearly smaller than any other vessel the player can select. Everything combines to make it feel unique, even if there are similar ships. But the game already has a charge shot. Wait 1/4th of a second and you get a triple shot, which is helpful for taking out faster enemies or hard to reach places. Oh but then if you wait five seconds, you get a second charge shot with a powerful projectile that does twice the damage and it pierces through enemies, but does less damage the longer it passes through enemies. It is basic, but easy to use. The ships with stronger attacks take longer to charge. One of the new pilots reduces the time it takes to charge a shot. The launcher boss drops mines... but now, the further you go in the game, the more variety you'll see. It will also drop rammers and then replace its launcher with a giant laser. The laser is easier to dodge if you have a ship with dash, since the dash let's you go through even a fat laser with no damage to the ship. With that said, I'm lucky to make it past the third boss, let alone to make it to the fourth and then sixth. The coins now accumulate when you collect them. At a game over, you're given a bonus coin for each 1,000 points. So 450,000 points translates into 450 extra coins. It feels easy enough to get 500 - 1,000 coins in a single run between collecting them and bonuses. At the moment, there is nothing to do with the coins, but in the future they will be used to unlock pilots and ships. In addition to dual and tri shot, there's now triple and big shot. The big shot doubles the size of a bullet along with its damage while the triple shot fires three projectiles forward rather than in a triangle pattern. It should be noted that the collectables that get dropped from enemies have been broken into three categories, health, wealth, and weapons. Health contains shields, health and lives. Wealth contains projectile to coin, 1,000 point pickups and magnets. Weapons have all four of the weapons and the bomb. This category system is used for the new pilots. Extra lives happen more frequent in easier difficulties. The clock starts at three minutes. For each level completed, a minute or more is added to the clock with a maximum of five minutes. On the easiest difficulty, players are granted more time, where running low is never an issue. The clock was added, because otherwise the player can dash wipe bullets through the entire game to rack up points without getting out of the first level or two. If the clock runs out, the living players lose a ship, but get an extra sixty seconds added to the clock. With everyone I know playing a gentler shmup, I took the easy mode of Cloud Cover to a slower route. Enemy projectiles now move at half speed, at least for the first 10 or so levels. While this might seem like a good way to dodge bullets, this also means the player has more projectiles on screen for longer periods. The basic enemy that appears 97% of the time is also slower. At the end of each level is now a boss, except for the first level. Bosses now have a level rather than the boss being the level. This should extend the game a bit while making the player more motivated to not run out of time. The enemy appearances have been tweaked so the player will see all the enemies in 9 levels rather than 11. Everything may still be tweaked, but the bosses were given levels as it was tough to justify a mini boss followed by a bigger boss with no level between. 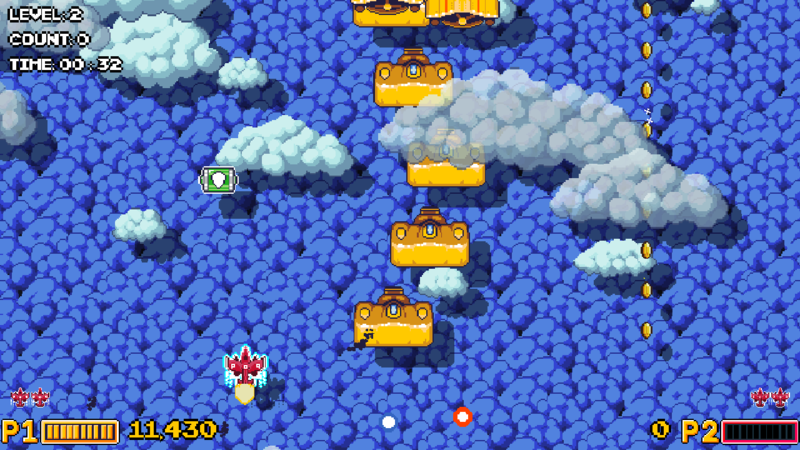 The mini bosses are all the same foe for the moment, but with each battle, the mini boss becomes more difficult. It goes from a forward shooting foe, to twisting and turning as it shoots. Then in later levels it gets two hyper lasers and later on even later levels, it will twist and turn the hyper lasers. With the game getting easier with the slower projectiles, there's now enough need for a fourth boss. The baker has a face, a shooting hat, fires toast and blocks with its arms. If you shoot the toast, it explodes into bullets. If you destroy the baker's arms, guns will come out. The objective is to disable the hat gun, followed by annihilating the face. The baker can be found at the end of level 12. Bosses and mini bosses now give a single health drop on their defeat. The smashers are a new collectable that spawns twin objects to smash into enemies. The objects also work as a shield as they will wipe projectiles. When shooting, the smashers keep a close distance to the player, but when not shooting, they extend out further and rotate faster to turn into a new and unique weapon. Like with the other weapons in the game, there is a time limit that starts at 10 seconds. Last edited by sitebender on Sat Nov 17, 2018 12:09 am, edited 1 time in total. At first glance I can say that your ships need to have "roll / banking" sprites for moving left and right. That would make them feel less stiff and flat. This is just an obvious thing I noticed right off the bat. Not allowing your ships, primarily the player ship to roll when strafing is disingenuous to the quality of your art, and makes it feel very mobile game-like. Thanks so much for the feedback. You're correct. I did forget the obvious with my lack of banking. The banking has 3 frames. The furthest banking happens at half a second and the initial banking starts at a sixth of a tenth of a second. I would suggest doing the same for those U-turn enemies if you can. I can. Tough to make that turn vector look convincing. After this, I added their own little flame trail. I played it a bit but not enough to give some really detailed feedback. That said, the reason I couldn't play it that much is that the ship movement has a really weird behavior. The speed doesn't seem to be constant, instead you frequently have your ship slow down for a second or two before resuming the regular speed. It feels very jerky, as if I was controlling an uncooperative horse rather than an agile shmup aircraft. I thought it was a bug specific to my own configuration or hardware or something but it seems like your own videos feature it. By the way, you can see the coins also have this jerky movement. If there was one thing to change/tweak/adjust, I would say this is the most important thing right now, before anything else. Another thing : Explosions shouldn't cover important elements such as the player, enemies, or bullets. The dangerous elements must always be on the top layers so that you can easily see and avoid them. On a side note, the icons for menu options and nice and it's a good way to more easily convey what they do regardless of language barriers, though I would add some text to them too. If you stop shooting, you move faster and start to charge your shot. If you move in one direction for half a second, you go faster. This was to solve the issue of players at the game jam wanted to move fast to get from the left to the right side of the screen, but wanted precision for dodging between two bullets and aiming as this is a simple shmup with a single stream of smaller bullets. I suppose that's a good indication to just make the bullets wider. When you let go of the direction, you do come to a dead stop. Originally, it was momentum based, but players at the game jam felt it was too icy and wanted a dead stop. So if you were to hold left for a half second to get to maximum speed, let go, then move again, you would indeed have to restart that again. The dash works well to move faster and that's a burst of 5x the speed to get out of the way and wipe bullets. Depending on if your ship has a dash. The wider the ship's bullet spread and the faster the ship is determines if it has a dash or not. I suppose a tutorial or a manual would help to explain this better in game. As for the coins having jerky movement, that could be coins explode out, while traveling up, then down in the air. When they hit the "ground" then they bounce. Indeed, bouncing in the sky. When they bounce they lose a lot of their momentum. Bullets are on top of everything, including explosions and clouds, but I will double check. Ships can still be under explosions. There is a setting to fine tune the explosion opacity and even turn them off. The menu seems to get a lot of praise. Although one person at the jam told me that they look too mobile and that's a detriment to a PC game. I did want to go for universal appeal, but once I start adding a lot of settings to the settings menu, there is now a need for additional text. I'll get some text on the menus and get some less grand explosions. * edit * For the next update, I've made explosions appear slightly over the ship they explode from and when enemies die, they're much larger death explosions will be under other ships and the player. I have also made text scoot out of the way if it is obscuring the player, bullets and enemies. If you want to have slower movement, there is a simple solution that feels a lot better than what's there in the game, isn't difficult to implement and already exists in some shmups such as the Touhou series : a focus button. Notwithstanding the dash, you would have two movement speeds : a relatively fast one that you have when the focus button isn't pressed, and a slower one when the focus button is pressed. No need to have to move in a direction for more than a half second or perform any other complicated set-up that makes tap-dodging and accurate movements a pain to do. And the fact that the player craft comes to an instant stop as soon as the movements buttons are not pressed anymore is absolutely a good thing. Inertia is really bad for this type of games and the players' reaction was the sane one. The coin movement makes more sense to me when you explain it that way, but i don't think the bouncing is visible in-game. The coins always seem to be at the same "height" and their horizontal position never changes so it just feels like they move downwards for a sec, stop for a quarter of a sec and then resume moving. Thanks for the further feedback. I am still trying to keep the game at two buttons, so rather than add a focus button, I'm making it so if the player holds dash and then moves, it's a focus, but if they're moving and then dash, it's a dash. With the player being so agile now, the triple charge shot seems a bit useless and I made it do more damage. The dash ends when the dash is no longer pressed. This is to prevent people from dashing into enemies. The player can wipe bullets for points with the dash, but not enemies. Some pilots even gain health from it and lose health if they fail to wipe a bullet. I think the dash lasts half a second, but you can dash as much as you want. With the coins, their weight makes them stop bouncing easily, but I think now I understand that I have to move the shadow too in order to show how far they are in the air. The shadow itself is off kilter in general. I have decreased their weight so they spend more time in the air and disperse further. - Modified explosions to appear on top of enemies, so when enemies die and the big explosions happen, the enemies will be lowered to be below other enemies, thus preventing larger explosions from blocking enemies. - Modified text to get out of the way of the player, enemies and projectiles. - Added unlock system and screen for pilots and ships. - Modified coins to have less weight so they fly further. Their shadows also match their height in the air, because they bounce. - Modified ships to always move at maximum speed. - Added new functionality to hold dash and then move will move slower, while moving and then hitting dash will be a dash. - Modified the triple charge shot to do twice the damage to make it more useful. Distracting background - It feels like the background takes too much focus from the action. The white clouds pop, move fast and in different direction then the background, and the background have a saturated blue. It might work to do some or all of: darker clouds, scroll slower, cloud move in the same direction as the background and background have a desaturated blue. You have probably seen the juice or lose it video, juice adds a lot to the games, but sometimes it can be too much. Think what you want the player to focus on and remove or tone down the rest. Less screen shake - I would suggest to remove screen shake, because the screen shakes almost all the time, which is too much in my opinion. I have noticed that in shmups because you shoot a lot of enemies and because it takes some time for the bullets to hit it's target it doesn’t feel like the player is doing the action that makes the screen shake in the same way compared to other games with less player bullets / enemies or games with close combat attacks. I also think that this would get more extreme with 2 players. Coin effects - I would also suggest to remove the score pop up from coins, or tone them done, because they are rather distracting. Also lower the volume on the pick up sound effect. Coin patterns - I like how there’s lots of coin patterns in the level, but it's frustrating when you can hardly pick up more than 50% of the coins and that’s when you put a lot of effort into it. This is because the player can’t move up or down (you can pick up the coins in the straight line but it's not very interesting to just wait). I think it might work to insead spawn curves of coins instead of circles and lines. S shapes, diagonal lines and different curves. I don’t think the player needs to be able to pick up 100% of the coins but I think about 75% would be reasonable if you focus on the pick ups. I didn’t noticed the dash move the first time I tried, maybe add some effect when you press the button without moving, just to give some feedback that the button does something. I feels like the bullet charge takes too long to charged, is it dealing more damage then just shooting normal shots instead? I would also be nice with instant feedback that the charge starts, like in megaman x or r-type. Thanks so much for playing. The background can be slowed down or stopped. The explosions can have their opacity changed to the point they become invisible. The screen shake can be toned down or turned off. All in the settings. I suppose this goes back to the "icons need text." I did want to give it a sense of thrilling speed, but ended up giving people motion sickness. True, you can't get every coin, but there are magnets, and yes straight lines are dull, but it lures the player away from the action. The coins were easier to get, before I made them lighter so they fly out further. I'll add S curves next time I get a chance. It will be interesting to have an S explode out of an enemy rather than a circle. Just the logistics and math of it. There is some effect to the dash, it leaves a trail, but I'll add something around the player or some different effect since the charge effect is around the player. The bullet charge takes 5 seconds, but it depends on the ship and pilot. Some ships take 8 seconds as they do more damage. Some pilots have 33% less charge time. There's also a mini charge with 1/4th of a second. The charge shot does pierce damage. It hits at 2x or 3x and drops by 1 damage point for each frame it is piercing a ship. So it goes from 20 to 19 to 18 to 17 and so on until it's doing 1 damage. The ships themselves do X damage per second depending on the ship, its bullet damage, its firing rate and how many bullets it fires. The ships that fire more bullets do less damage. The point is I can argue that the charge shot is more to hide, wait and then shoot. While the non charge shot is for the fodder ships. The mini charge is for the faster ships, but now that your ship is fast, the triple shot mini charge feels less useful, so I increased its damage. The game probably needs a manual, even if it was made in 1 week for the jam, then 3 weeks afterward. 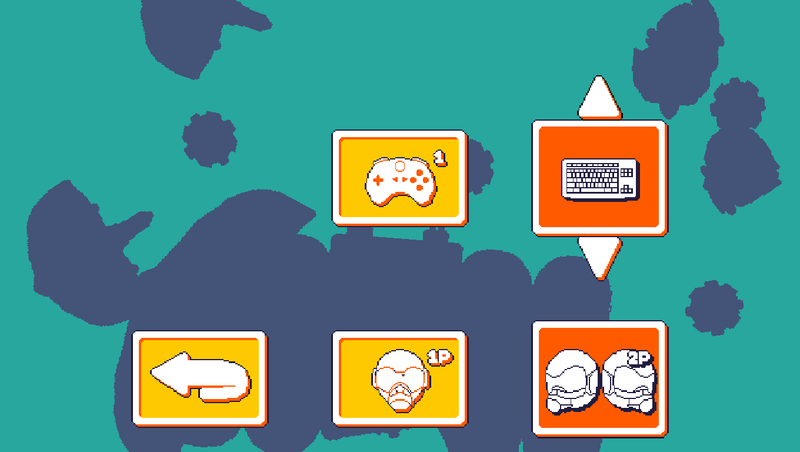 Lots of option icons! I could figure out most of them, except the one with a cloud and an arrow, I can’t spot any difference when I change it. I think menu icons a nice touch but it's probably worth it to also add a textbox somewhere with text when you select a icon. The screen shake option works well, but I couldn’t change the background. Charge: 5 seconds is a lot to wait in an action game. If I have to wait 5 seconds I’d expect the shot to be very powerful I played with the standard ship and it felt like the normal shot was more useful, except on the first boss when I had to wait for a window to get in front of it. I tried it a little with keyboard controls. Powerups are frequently overlapped by enemy shots, so that they can't be collected. It hurts because of the randomly wasted effort more than because of the loss. Suggestion: make enemy shots bounce off the powerup, protecting the player if enemies shoot from behind and causing a little mayhem if shots are oblique and the player isn't collecting the powerup. 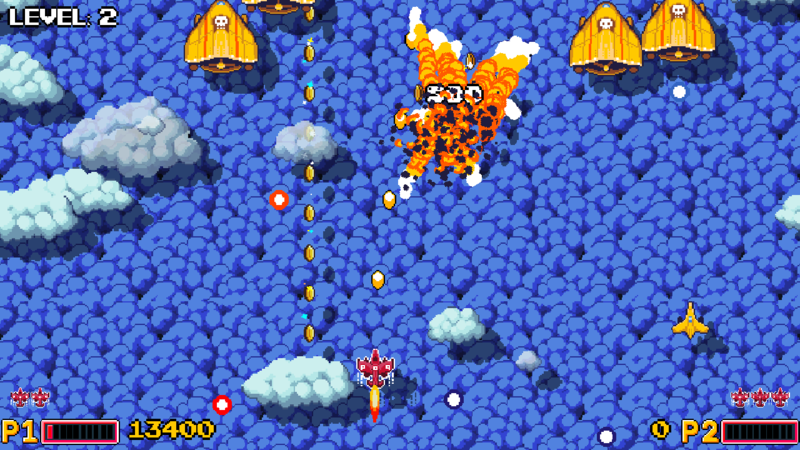 Generally too fast to allow for good interactions: too many coins and enemies are gone before the player can reach the other half of the screen, let alone deal with them. Suggestion: the wide vertical playfield format requires a very slow pace or unusually wide firing patterns. You could switch to horizontal scrolling (it would mean replacing most graphics, but clouds could be gorgeous) or to a portrait aspect ratio with appropriately scaled speeds and sizes. Levels measured by killed enemies aren't great because the player can simply play very defensively and wait for easy to kill targets. Suggestion: instead of going away, enemies could (with the appropriate exceptions and limitations) stay on the screen and put up a fight. This way the player would need to play aggressively and kill everything fast (with appropriate firepower, of course) to avoid being overwhelmed. Dodging is difficult because the player ship is clumsy. Suggestion: since bullet patterns are already reasonably fair, slow down enemy bullets and speed up the player ship, about evenly. 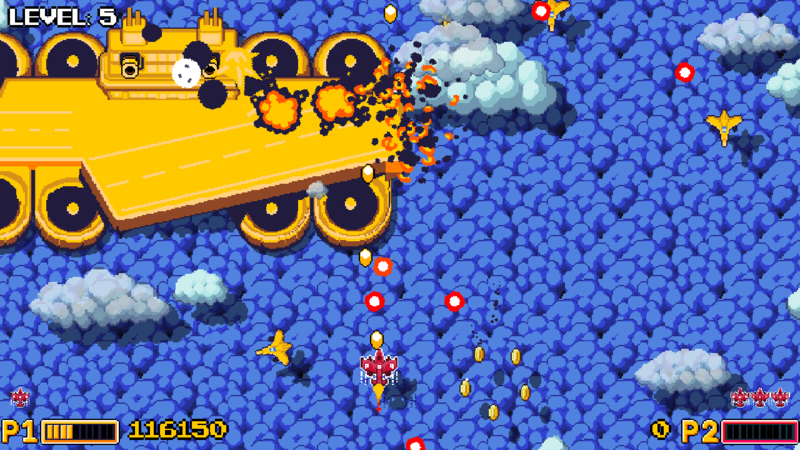 The player shoots slowly, but the game is too fast and complex to allow shooting bullet by bullet like in Space Invaders. Suggestion: a higher ROF, at least double, and less damage per bullet would look better, allow reliable extermination of popcorn enemies, and reduce randomness. - Modified coin lines to shift rather than be straight forward. - Added an easy ship for testing, kids, and terrible players. - Added a notification if a ship is easy or normal. 90% are normal. - Added more pilots, even if the majority of them do nothing unique yet. - Fixed a crash related to hard difficulty. - Modified pop up score text to be smaller for less than 100 points. The slower bullets, mean more bullets on screen, so it basically makes the game harder. There's a pilot that makes any ship move double speed. The easy ship for kids and terrible players is actually invulnerable to projectiles. 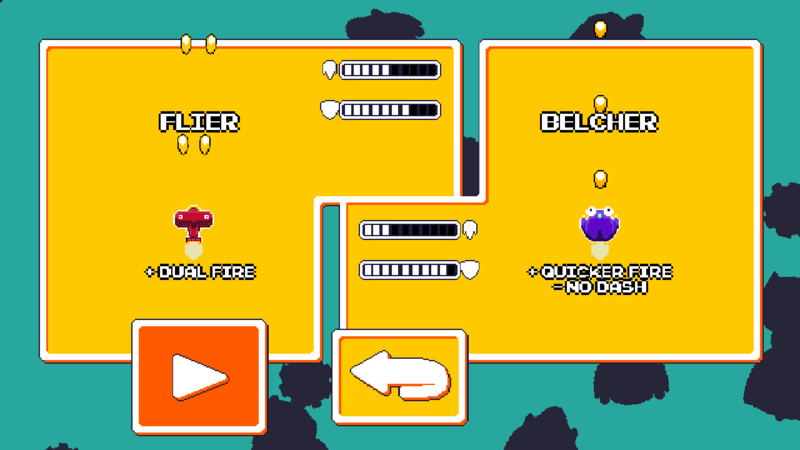 As for power ups blending in with enemy projectiles... you can always shoot the power ups and juggle them. With the player bullets being too slow for a fast paced game... most enemies literally just move down. There are stronger enemies that are designed to be a wall to restrict the player. Some ships have higher attacks, or faster bullets. The challenge is risk reward, do you sit there to kill it or do you dodge? There's also a wider shot when you don't shoot for a fourth of a second. All I can say is... dodge faster. Make your choice sooner. There is a way to slow down the background in the options, but that's my bad for not having explanatory text with the icons. That will be for a future update. And yes levels based on how many enemies destroyed aren't great, because you can indeed play defensively... especially if I give the player a faster ship and make the bullets slower. Plus the fact you can charge a shot over 5 seconds. Sure the charge shot might not be viable in the levels, but they're viable for the bosses. There are pilots that speed up the charge of the shot. Thank you for giving it a shot.